826CHI has just launched the 3LIT Education Series, a series of workshops and discussions that supports educators in teaching standard, cultural, and critical literacy. We'd love to invite you to participate in any or all of these events in our space! The 3LIT series is made possible in part by Illinois Humanities, the National Endowment for the Humanities, and the Illinois National Assembly. Sunday, 7/15, 3-4:30pm // 3LIT Education Series: Empowering Students to Lead with the students of the Teen Writers Studio. Driven by the belief that those most affected by educational equalities--the students--hold solutions to creating a more equitable education system, this student-led workshop and discussion will address how to make the classroom a brave space, how to engage students in productive conversations about gun violence, and how to create culturally relevant and responsive literary curriculum for high school students. 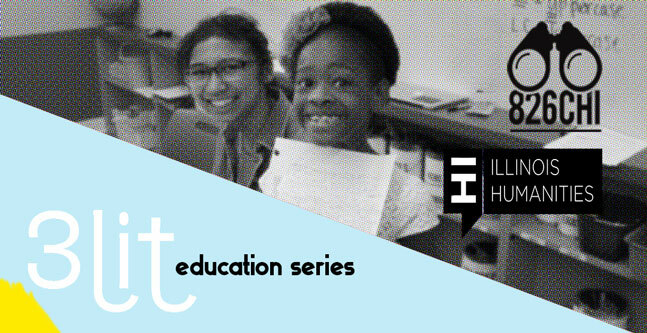 Sunday, 7/29, 3-4:30pm // 3LIT Education Series: Organizing in the Classroom. Community organizing is the practice of strategic thinking and planning skills used to create social change. As educators, we don't think we need these skills inside of a school, however they can be crucial to developing leadership among educators and students. Students often complain curricula is not culturally relevant; using organizing tools and action plans to address issues in their lives can improve the inter-generational engagement within a school context. Led by seasoned educator and community activist Hilda Franco, teachers will explore designing action plans through the lens of an educator in a school. Sunday, 8/5, 3-4:30pm // 3LIT Education Series: Writing as a Tool for Community Building. How can we use writing to bridge cultural and linguistic gaps between students and educators and among students in order to foster a sense of community? How can we empower students to advocate for themselves and for their communities through writing? Moderated by 826CHI's Director of Programs, Maria Villarreal, this panel discussion between Chicago Public School teachers Meg Morrison and Theodora Kuhn, Quinn Daniels, the Director of Coaching for City Year Chicago, and T Clutch Fleischmann, a published author and writing professor at Columbia University, will address the path and obstacles to using writing and literacy education to build community amongst students, administrators, and the broader school neighborhood.